With the challenge being central to procurement organizations is to do more and save more, strategic solutions must also bring more value to the bottom line and adapt to an “As-a-Service” movement. Through time and experience of working with a multitude of clients across industries, we know that companies must do more than simply “control spend”. They must create and implement a strategic plan that will promote growth and value in all aspects and not just in procurement. 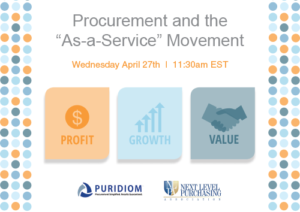 Learn more through this podcast on what procurement “As-a-Service” looks like and the reasons why it is a unique method and not just an outsourcing activity. Co-Founder and Principal of PGV Advisors, Christopher Clabby, has shared his expert insight during this podcast which will stimulate the ideas of potential that may be waiting to surface within your own procurement team.